Hi friends, we are back with an awesome news of an 1 Re flash sale of the one plus 3T mobile phone and one plus accessories. The good thing here is that you have to collect the point and by these points you can buy any of these things in the flash sale which was open on every Friday December (9, 16, 23, 30) 12-6PM (IST). 1. 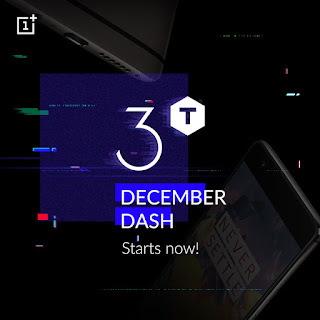 Visit OnePlus 3T December Dash sale page. 2. Scroll Down and Complete these tasks to participate in OnePlus 3T December Dash Sale:- Sign in, Verify Mobile, Add Address & Share. 4. Verify your mobile number by filling OTP. 5. Provide your shipping address. 6. Finally share this on Facebook, Twitter and all social media with #3TDecDash hashtag. Open 12 – 6Pm (IST) every Friday in December (9, 16, 23, 30) while stocks last. Prizes may change at any time. As an additional token of appreciation, those who entered the Diwali Dash will get bonus points. If you register your OnePlus smartphone IMEI, and you get a Rs. 250 OnePlus coupon redeemable at the OnePlus India Store. Use your points to claim your prize in the Prize Shop. The Prize Shop is open 12 – 6pm (IST) on every Friday in December (9, 16, 23, 30) while stocks last. Prizes may change at any time. Once you’ve claimed your prize, pay ₹ 1 within 3 hours to place your order. Prizes that are not paid for expire after 3 hours. Once claimed, points are deducted from your total and your prize cannot be unclaimed. Pay ₹ 1 within 3 hours to place an order with the claimed prize. Prizes that are not paid for expire after 3 hours. Prizes are shipped to the address you entered during the Entry Challenge. We cannot guarantee delivery for all addresses across India – you may be asked to supply a different one. For products sold at ₹ 1 (including the Prize Draw) during the 3T December Dash Sale, oneplusstore.in return policy is not applicable. OnePlus & Mobitech Creations reserve the right of final decision on the interpretation of the Rules (How to Enter section on event page). Collected data may by used at oneplusstore.in or oneplus.net. All new users who complete the Entry Challenge during December 2-28 are entered into the weekly prize draw to win one of three OnePlus 3T 64GB devices. The prize draw takes place every Saturday in December. Winners are notified by email shortly after. Points, payments and order statuses may take up to 5 minutes to be updated – try refreshing your browser at timely intervals. That's all of you have any query or question please do comment. Thanks for reading this post. Please do share this post with you friends.